Brother DK1208 Large Address Labels BRTDK1208 $12.95 Large, die cut address labels make customized label creation a breeze to quickly identify and organize your contents. Dura coated paper creates crisp, high quality prints for professional results. You can print them directly from Microsoft Word, Excel or Access with just a click. 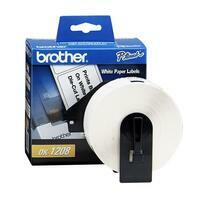 Or, have fun and get creative using Brother's intuitive label design software. Labels come 400 per roll. Labels are designed for use with Brother QL 1050, QL 1050N, QL 1060N, QL 500, QL 550, QL 570, QL 570VM, QL 580N, QL 650TD, QL 700, QL 710W and QL 720NW label printers.